What Is The Green Deal ? The Green deal was introduced by the department of energy and climate change to help consumers and comapnies reduce their energy consumption through the installation of energy efficiency measures on existing buildings. 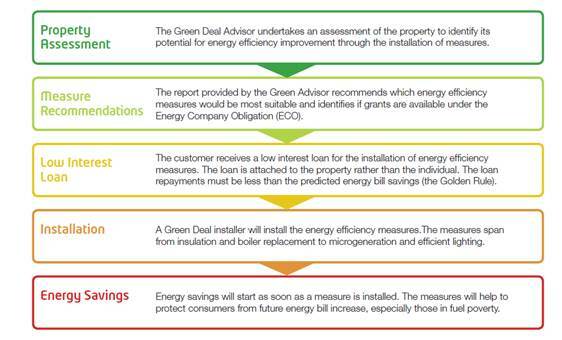 How the Green Deal works can be broken down into 5 simple steps. Please see the flow chart below to understand the processes involved. For more information read through the NICEIC PAS 2030 Registration Guide. You can pay for energy-efficient home improvements through savings on your energy bills. Interested? Please find more information below to help. This entry was posted in Energy News and tagged Green Deal, NICEIC on 16th October 2017 by admin. High street giant John Lewis has teamed up with NICEIC for a new service it is rolling out in a number of areas across the UK. Home Solutions will put customers in direct contact with professional tradespeople that it has carefully checked, vetted, interviewed and assessed. The service was trialled in Milton Keynes earlier this year and will operate in six other locations including Cardiff, Bristol, Newport, Bath, Taunton and Gloucester. NICEIC CEO Emma Clancy said: “We are delighted to be working with John Lewis on the electrical side of this initiative. John Lewis approached NICEIC last year to find electricians for the launch of the scheme. Several NICEIC registered contractors signed up to take part and a rigorous recruitment process was put in place, which included interviewing the tradespeople, background checks, and assessments of work they had done previously. “The John Lewis brand is associated with quality and so we felt it was a natural fit for NICEIC,” added Emma. “John Lewis wanted a brand they could trust and we felt this was something that would appeal to our registrants. One of the key requirements was that everyone involved was a reliable and high quality tradesperson. “There is no cost to sign up. It is completely free and a great opportunity for contractors to grow their business and be associated with one of the most recognised and respected names in the market. John Lewis customers will be able to hire plumbers, electricians, decorators and other trades through the app, website and call centre-based service. “As a trusted retailer of home products, our customers often ask us if we can help them with tasks in their homes,” said Tom Athron, who is group development director at the John Lewis Partnership. This entry was posted in Industry News and tagged John Lewis, NICEIC on 14th October 2017 by admin.